For those of you who don’t know, Teppan Edo is a delightful restaurant found in the Japan Pavilion located in the World Showcase at Epcot. That was a mouth full, wasn’t it? 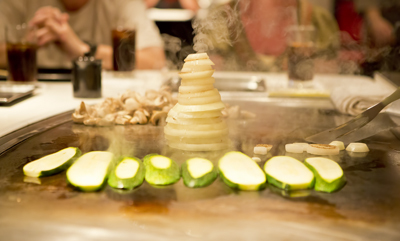 Here you can enjoy teppan-yaki-style cooking prepared right at your table by a talented Japanese chef. It’s not just a meal, but a fun and unique experience. Trust me, it’s something to put on your culinary bucket list! 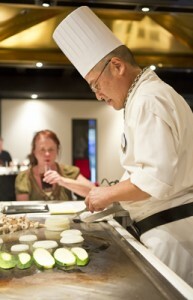 Teppan Edo is my favorite place to eat in the World Showcase for two reasons: the memories and the overall experience. The first time my husband and I went to Disney World together, it was our favorite dining experience of the trip. We were with my parents and Michael’s aunt and uncle. Michael had raved about this place as he had been there once before. With such positive reviews coming from a Disney Curmudgeon, I knew this was definitely a place I had to try. Following our arrival, we waited in the “lobby” for a short time before being seated. As we walked down a long hall way, I could peak into each room to see wait staff and chefs tending to their guests. I couldn’t wait to get started! Now, the grill is centered around family-style seating so if you’re an introvert, you may have to keep an open mind. My parents could talk to a wall, so they plopped right down next to a middle-aged couple from New York. Yes, they had a New York accent. Yes, I couldn’t get enough of it. We soon learned that they were teachers like my mom, so they all had plenty to gab about. The chatter didn’t last long as our waitress promptly arrived to take drink and food orders. Although there are appetizers to choose from (click here for the menu), we went straight for the entrees. I decided to spoil myself, so I ordered the filet mignon (I’ve also had the Nihonbashi, or chicken and steak, which is also very good!) Although the prices are on the higher side, this is definitely a meal to splurge on. Entrees start at just under $18.00 while the kid options begin at $13.00. If your child isn’t a big eater, consider sharing with him or her. It will be just a little friendlier on the wallet. Housekeeping detail #1: Menu prices stay the same for both lunch and dinner, so it doesn’t matter what time of day you go. 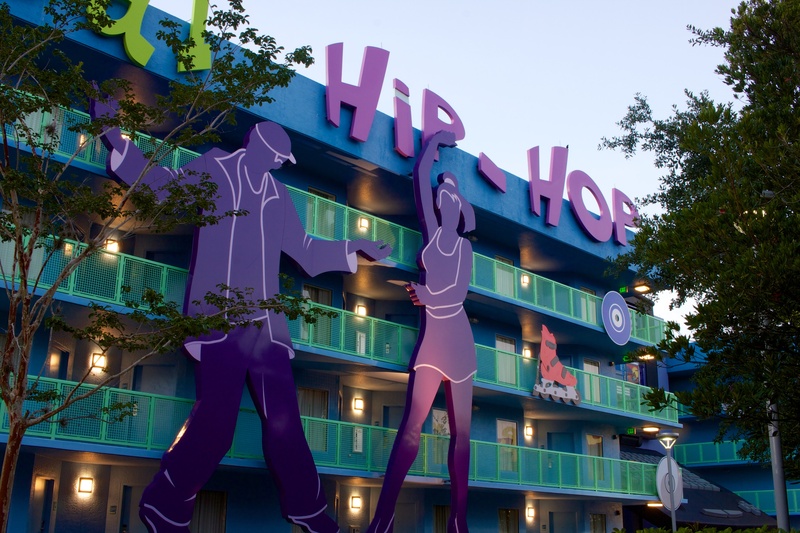 Housekeeping detail #2: The Disney dining plan is accepted here. Tables in Wonderland cannot be used. Soon after our orders were taken, the chef arrived with his supplies. He introduced himself and asked if there were any food allergies within the group. My mom is allergic to shellfish and nuts, so we were sure to mention that when we had made the reservation. The chef was very attentive to her needs and was sure to verify her dietary restrictions before starting the meal. Every restaurant I have been to at Disney World has done this. The chef will come out and converse with whomever has the food allergies. Rest assured; you’re in great hands! The chef, whose name I can’t remember as it was three years ago, set to work on the vegetables: zucchinis and onions. Next, he added the Udon noodles and meat. For my mom’s portion (the one with the allergies), he put her meat off to the side away from the others so as not to cross contaminate. Both his culinary skills and his presentation were magnificent! While cooking over a very hot stovetop, he performed tricks and flips with his pepper shakers and cooking utensils. I will say that at a typical restaurant, there is that period of dull down time where you wait for your meal to arrive. Not here. We were kept engaged and entertained the entire time. We saw it all, from the chef flipping his shakers behind his back to the popular onion volcano. He shared funny jokes and pointed out a (not so) hidden Mickey he created with the onions. It felt like a dinner show and really, it was! We received our veggies, noodles (and rice) and then our meat. We were given a selection of dipping sauces to try with the food as well. If there was any downside to the experience, it was that we did not receive all of our food at the same time. This is simply because some food items take longer to cook. This in no way took away from the experience and shouldn’t deter you from trying it for yourself. The food was deeeeeeelicious. There’s something very satisfying about eating food you witnessed being prepared from start to finish. There was more than enough to appease the appetite and I even had leftovers at the end of the meal. A+ in my book! Okay, back to that couple from New York. As we all were finishing our meal, the man mentioned casually (in his cool accent) that it was his birthday. Now, I come from a Polish family. When we celebrate birthdays, we sing, “Sto lat.” This is a Polish song, sung at occasions such as birthdays, used to express well wishes and a long life to the special individual. It basically translates to, “May you live a hundred years.” Michael looked at my mom and, as a joke, started quietly singing the song. Mr. New Yorker’s eyes lit up and he exclaimed, “Hey! I know that song! I’m Polish too!” Well at that point, the entire group broke out into “Sto lat,” as guests from other tables stared in our direction. Half way through the song, we heard a noise come from the hallway. A different man had sprinted down the hall way when he heard us singing and darted around the corner to join in as well. It was such a random and cool experience. We all felt united and bonded as we celebrated this New Yorker, a stranger mere hours ago, on his special day. Following the song, we clapped and broke out into laughter. While it may be fun for people who don’t have this type of restaurant near their home, I found this p[lace to be extremely over priced, even for Disney. The only place I ever left hungry. I’m sorry to hear that Paul! Perhaps you could share your favorite restaurant at Disney World? I’d love to hear it! My 5yo DD and I tried Teppan Edo for the first time in September and I’m only sorry it took us so long to hear about it and give it a try! We’ll be back for sure!! Isn’t it fun? I would go every visit if I could! 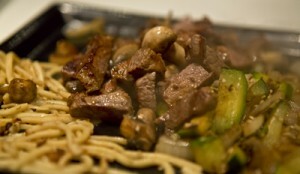 I love this kind of place (Benihana); but I too was underwhelmed. And I wish there would have been someone around to ask about Sake and the different types. I wanted to try some, but no one serving the tables had (or would give) any information. Also our chef was pretty restrained. Maybe she was new, or that is just how she is. But it takes away from the experience. I did very much enjoy meeting and talking with a man there from Miami with his young son. That part – meeting other people – is very enjoyable. I’m sorry your experience wasn’t completely positive. I hope you’ll give it another try the next time you visit! An experienced, relaxed chef really makes a difference.